In this museum, we can know how the noble families of the Heian Era lived. Genji Monogatari (also known as The Tale of Genji) is a long story - perhaps the first novel - written in the Heian Period by Murasaki Shikibu. The story is set in Kyoto. It is very famous in Japan, especially in Kyoto. There is a museum dedicated to Genji Monogatari in Uji City, and I live near this museum, so I went there. 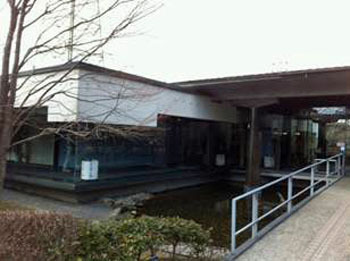 The Genji Monogatari Museum is located in a residential area of Uji City. Ujigami Shrine is nearby. It is also close to my house. It takes about ten minutes to get to this museum. Recently, the museum was remodeled, so it looks very clean and modern. The admission fee is 500 yen for adult and 250 yen for child. The nearest station is Uji Station on the Keihan Uji line. In the museum, there are many exhibits which relate to Genji Monogatari, and this photo is one exhibit put next to the entrance. Many decorations make a good atmosphere. This is an ox-drawn carriage. 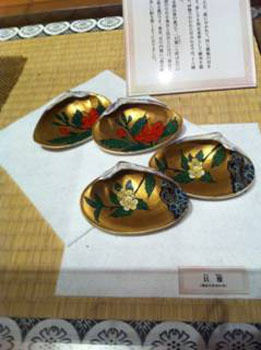 It was used by the courtiers and aristocrats of the Heian Era. We can say that it symbolizes the world of Genji Monogatari because it is a vehicle for a person who has enough power and money to raise oxen and employ cowherds. There were legal limitations on the decorations and materials for nobles who did not have much power. 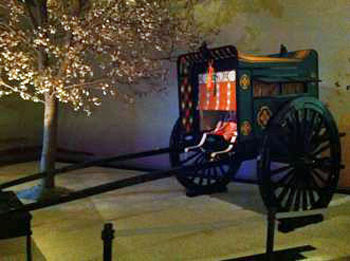 The decorations and colors of an ox-drawn carriage showed the sensitivity of the owner. These shells were used for one of the games the nobility played, called "Kai Awase". This game was played by two people. Players pooled the same kind of shells, and they compared the form, the color, the size and the rarity of shells. There was also a second way to play, using shells that were painted inside. There were two shells with each design. They turned all the shells picture-side down and had to find the matching pictures to make a pair of shells. Maybe it was the original "Concentration," the game played with cards turned face down, where players try to remember where pairs are. Nobles of the Heian Era also played a game called "Hentsugi" using these cards. "Hentsugi" is a game of imagination. 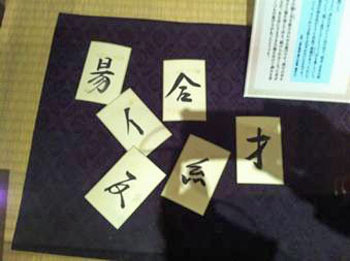 On each card, one part of a "kanji" (Chinese character) is marked, and players have to make several "kanji" by using the same cards. Players are not allowed to make up new "kanji". 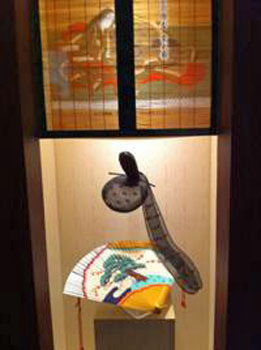 This is a diorama of a famous scene from the book in which one of the principal characters sees "Okimi" and "Nakanokimi" playing musical instruments in the night. This is the famous start of the story. This museum is small, so it doesn't take too much time to look around. It is really worth visiting here once for a person who likes Genji Monogatari. Even if you don't like Genji Monogatari, you can visit many other famous places, so please come to Uji City once. You will like there! Child Research Net would like to thank the Doshisha International Junior/Senior High School, Jo Oya, student and author, for permitting reproduction of this article on the CRN web site. 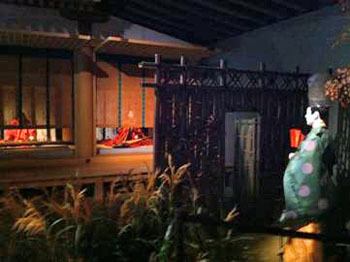 CRN expresses our appreciation also to the Genji Monogatari Museum for permitting us to post the photos of its exhibitions.